When cells need to wrap a molecular for safe delivery elsewhere, they use a lipid vesicle or liposome. The building block for a liposome is a lipid bilayer which has folded back on itself to create a closed spherical shell. Liposomes are relatively easy and cheap to make synthetically, and they already find applications in drug delivery systems and expensive cosmetics. But liposomes are delicate – their walls are as thin and insubstantial as a soap bubble, and a much more robust product is obtained if the lipids are replaced by block copolymers – these tough molecular bags are known as polymersomes. Polymersomes were first demonstrated in 1999 by Dennis Discher and Daniel Hammer, together with Frank Bates, at the University of Minnesota. Here at the University of Sheffield, Giuseppe Battaglia, a PhD student supervised by my collaborator Tony Ryan in the Sheffield Polymer Centre, has been working on polymersomes as part of our research program in soft nanotechnology; last night he took this spectacular image of a polymersome using transmission electron microscopy on a frozen and stained sample. The polymersome is made from diblock copolymers – molecules consisting of two polymer chains joined covalently at their ends – of butylene oxide and ethylene oxide. The hydrophobic, butylene oxide segment forms the tough, rubbery wall of the bag, while the ethylene oxide segments extend out into the surrounding water like a fuzzy coating. This hydrophilic coating stabilises the bilayer, but it also will have the effect of protecting the polymersome from any sticky molecules that would otherwise adsorb on the surface. This is important for any potential medical applications; this kind of protein-repelling layer is just what you need to make the polymersome bio-compatible. 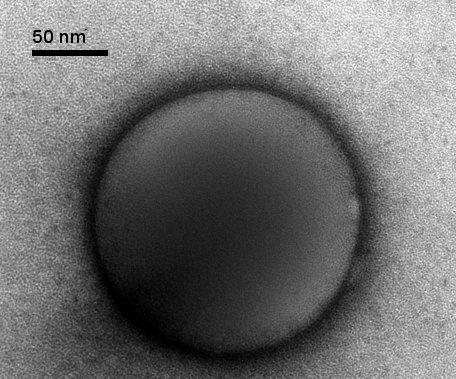 What is remarkable about this micrograph, obtained using the facilites of the cryo-Electron Microscopy Group in the department of Molecular Biology and Biotechnology at the University of Sheffield, is that this diffuse, fuzzy layer is visible extending beyond the sharply defined hydrophobic shell of the polymersome. Now we can make these molecular delivery vehicles, we need to work out how to propel them to their targets and induce them to release their loads. We have some ideas about how to do this and I hope I’ll be able to report further progress here.